The on-site restaurant not only offers delicious fare, but many items use ingredients fresh from Volcano Gold Loft's farm. 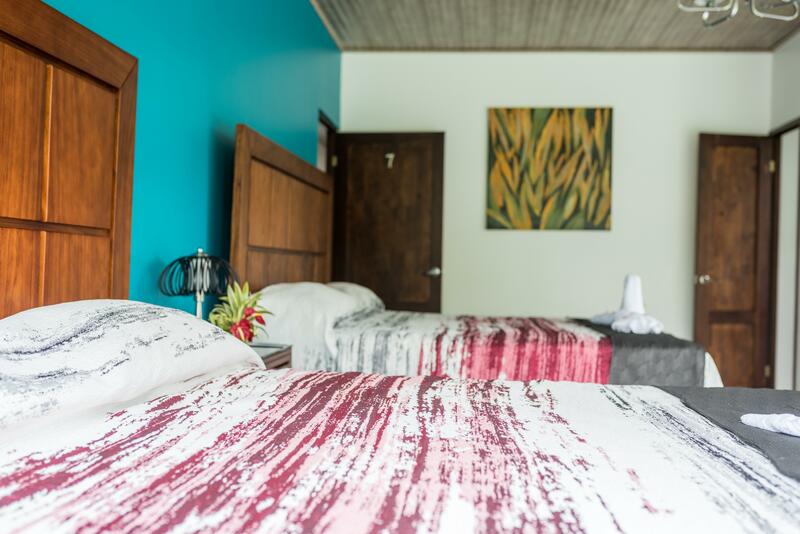 After you've been well-fed and find yourself in need of a little quiet relaxation, you can enjoy the hotel's 'Reading Ranch' — a lovely outdoor space in which you are surrounded by lush Costa Rican foliage. The covered space shields you from the sun on warm days and allows you to enjoy the fresh, sweet air and the sound of rain on moist days. Add a cup of tea or coffee and you'll finish your book in no time! The Quadruple Room - Is outfitted with two queen size beds, a sofa, and a small dining area. You will enjoy mountain views from oversized windows that are almost floor to ceiling. The Double Room - Allows the two of you to get cozy — if you're traveling solo, stretch out and relax. A queen size bed, oversized windows with views, and a small dining table make this the perfect place to retreat to. Take your time enjoying Costa Rica from the comfort of Volcano Gold Loft — where simple indulgence meets easy access to outdoor adventure. "Really cool hotel. only 8 rooms with great staff and privacy. right in the jungle!" Really cool hotel. only 8 rooms with great staff and privacy. right in the jungle!